Download our Club's Handbook here. Welcome to our website. We hope you will find it useful and informative. If you have any questions about our club and its activities, please feel free to contact us. 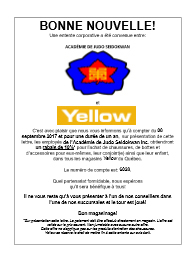 Seidokwan is the oldest Judo Academy in Quebec, having been founded in 1952. It was incorporated as a non-profit organization 1981. To find out more about our beginnings, please consult our Brief History section. Seidokwan and Yellow Shoes are happy to announce that as of September 8th, 2017, for a period of one year, you receive 10%* discount on all footwear and accessories purchased. Click here for more details and to download the agreement. Website created and maintained by Alexram Internet Services. All rights reserved © 2002-2019 Seidokwan Academy of Judo Inc.